We are happy to announce that IMT will be listed at TOP exchange. 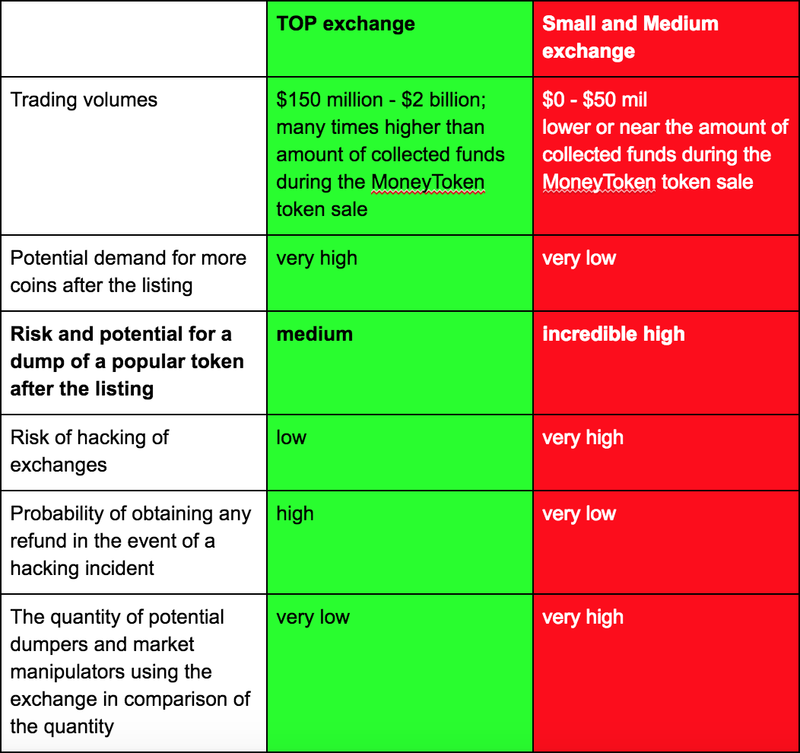 During the last week the IMT token has been listed on a number of small and medium exchanges without the confirmation or the permission of MoneyToken. IMT has been listed on these exchanges by professional dumpers and market manipulators whose goal has been to dump IMT tokens; which they can then buy at a low price for resale after we are listed on legitimate, approved exchanges, at a higher price. Youtubers CryptoJack and Money Guru have launched polls in order to learn from the opinions of the community about the problem of exchanges who are listing IMT token without the permission, and how the token distribution strategy should be managed. As a result of the token distribution poll, the withdrawal of IMT tokens will be enabled at the same time with the listing on TOP exchange. It will protect IMT holders and prevent the possibility of IMT trading on illegitimate exchanges before hitting the TOP exchange. Further updates about the listing of IMT on TOP exchange will be published on our Medium channel according the listing progress. The token sale is finished but the team still continue to work hard on enhancing and improving MoneyToken! We want to take this opportunity to say a huge thank you to all our community members for their support and confidence. Answers to frequently asked questions and a detailed explanation of why the withdrawal of IMTs right now is bad and the withdrawal of IMTs later is better are provided below. Why is IMT already listed at some exchanges ? We have identified that IMTs have been listed by several medium and small exchanges even before the start of withdrawal process of IMT tokens from the platform. These listings were performed without signing any agreements with the MoneyToken team and without any permission from us. This is clearly bad practice and behaviour; intended to hurt our community and cheat our token holders. Which risks does it bring to IMT holders? After the listing some users could try to sell IMT tokens, but there are no audience which could buy IMT token after the listing, and there will be no liquidity to support the token growth potential so the price for IMT token will be guaranteed dumped. Why is distributing tokens at the same time as hitting TOP exchanges better than distributing right now? Large exchanges have billion dollars of trading volumes and a very large audience of real traders who could buy IMT tokens from token sale participants. The risk of low price sell-offs and dumping behaviour is much lower with the major exchanges. Is it secure to hold IMT tokens on the platform account? Are there any risks that the platform will be hacked and IMT tokens will be stolen from my balance? All IMT tokens are stored securely at cold addresses. Private key stores have never been connected with the network and there is no opportunity that hackers could access this data. MoneyToken community members can be sure that their IMT tokens are safe. We advise to all IMT holders to use the Google Authenticator application to secure their own accounts from the social engineering attacks. How long could listing on the TOP Exchanges take? The team is in negotiations with TOP exchanges already and will make every effort to deliver the results to the community as soon as it is possible. Completing all documentation and application. Completing and passing all due diligence activities. Undergoing a Smart Contract audit. Undergoing an audit of our business model and the token sale. Technical integration of our token to the exchange. Official announcement of the listing. What can I do with my IMT tokens while they are locked up in my account? Why have more than 62% of bounty participants been rejected ? Does it mean that MoneyToken is being unfair to people who helped to spread the word about MoneyToken? An independent auditor was invited to conduct the audit of the MoneyToken bounty program. The auditor team consist of members of the DT community, who are among the most active and long standing members of the bitcointalk.com community. As a result of the independent audit a large number of accounts were rejected because of account farming, spamming activity, duplicating content, and other violations which are prohibited on the forum. A number of accounts were utilising large numbers of bots in order to gain as many tokens as possible — this is grossly unfair to all the decent and honest bounty participants out there and to all our token sale holders. I am a fair participant, I am not an account farmer, spammer, any other rules violator, but I didn’t pass the audit. What should I do? If you are a fair bounty hunter, but you didn’t pass the audit due to some misunderstanding by the auditor, MoneyToken promises that we will review your case and if your appeal is successful, we will ensure that you will receive your IMT tokens. All that you need to do is complete an appeal. To file an appeal, please, follow this link. Bounty Hunters who miss the appeal deadline will lose their opportunity to appeal. After 7th July all appeals will be reviewed. You will receive a notification about the status of your appeal by the 15th July. If your appeal is confirmed you will be able to find your ETH address and the amount of IMT reward at the updated the IMT distribution whitelist on the 16th July. You will receive your IMT tokens on your balance at account.moneytoken.com on the 18th July. At this time only 257 users out of several thousand of restricted users have filed an appeal. Why do users need to pass KYC? MoneyToken is in the process of establishing strategic partnerships with other platforms and systems to support fiat currency loans, and are obtaining financial licences in several jurisdictions to get MoneyToken access into the fiat world. Offline and fiat companies are closely regulated by law, and as a result KYC of all IMT holders has become a compulsory requirement for potential partners. We have decided to comply and fulfill these requirements because the partnerships on offer are hugely important for the future scaling and development of MoneyToken. A lot of fake and fraud accounts were detected during the audit of the Airdrop and bounty program. KYC will allow us to additionally filter out fake accounts and, as a result, help prevent the risk of fraudulent token dumping activity. The successful KYC of all token holders will help MoneyToken to conform with regulatory requirements in the future cryptoworld, which as we can see is becoming more and more strictly regulated with each passing day. Does the distribution delay mean that MoneyToken is scam? MoneyToken is not a scam and never will be. MoneyToken was formed in Feb 2017, 1 year before the private sale started. The platform was launched before the start of the token sale and a new release of the platform came out last week. The easiest option for the team would have been to distribute tokens exactly after the token sale and set it adrift at random exchanges. Zero interest rate membership was implemented to allow users to try out the platform and understand better how cryptocurrency-backed loans work. We are grateful to all community members who joined us at the early stage, supported us during all this time and continue to keep their confidence in MoneyToken. We promise to never stop the development of our financial ecosystem and bringing as many new financial instruments to our community as it possible. We believe that our community is our most powerful tool for spreading the word about MoneyToken around the whole world and making our platform a huge success and a game changer for the financial industry. By supporting us you are helping to disrupt the loan industry and bring truly decentralised banking services one step closer.